We have been supplying vehicles into the United States for years, and the time has finally come for us to start building vehicles for the market in America. Foley supply the option for you to choose the colour of the vehicle and the specification. Our goal is to keep these vehicles true to the roots of Land Rover the brand itself. All vehicles are original LHD (left hand drive) and will have zero hour 4.0 V8 engines, auto gearboxes and air conditioning. Built on new galvanized chassis' powder coated black, five new style steel doors, puma front seats, puma middle row seats with three point genuine belts, with options in the rear. 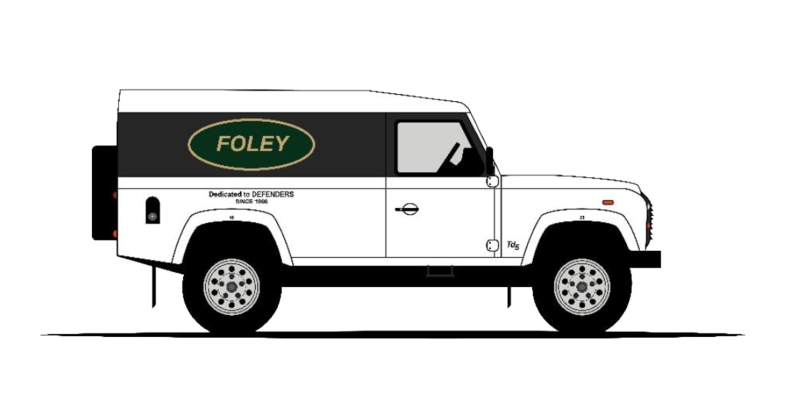 These vehicles will be supplied by Foley's in London, England. They will then be hand finished at our facility in the US and sold via US based agent. He will indeed look after you and all your enquiries, purchases and aftercare. Tangiers Orange with Orange Roof. This includes, zero hours 4.0 litre V8 engine, automatic gearbox, new galvanized chassis, Puma steel doors, air conditioning, alloys, top grade carpet and full nut and bolt built from scratch. A list of extras are available to suit your vehicle requirements.